High Resolution Computed Tomography (HRCT, also known as X-ray microtomography) is a nondestructive imaging technique that allows the ultra-high-fidelity reconstruction and visualization of external and internal features of non-living objects. This technique has the potential to revolutionize collections and collections-based research, and has many applications in an ever-growing range of biological systems; although HRCT has traditionally been limited to visualizing denser material (bone, fossil etc. ), improved hardware and new contrast-enhancing techniques now allow this technology to visualize many different types of soft-anatomy in exquisite detail. The Blackburn Lab is exploring the myriad research and educational opportunities of this technology as we visualize and quantify the morphology of living and extinct amphibians and reptiles for both systematic and evolutionary studies. Here are some examples of how our work is benefiting from CT technology. Click to watch my talk "Unlocking the Full Potential of Natural History Museum Collections with Computed Tomography"
As CT is entirely non-destructive, rare and important specimens can be scanned and then digitally dissected. This is particularly useful when describing new species, as it allows a detailed assessment of internal anatomy of type material without having to damage the specimens in any way. CT data reveals important diagnostic characters that help us describe new species, including girlded lizards from Angola, Cordylus namakuiyus, and several new species of horned tree frogs of the genus Hemiphractus, from Central America. An additional bonus to CT scanning is that the scanned data can be converted into annotated models, which help articulate character states and can be shared with collaborators and other interested parties around the world. (see the interactive 3D models for examples). Computed tomography provides a way to look inside fossilized specimens and view structures that simply can't be visualized any other way. 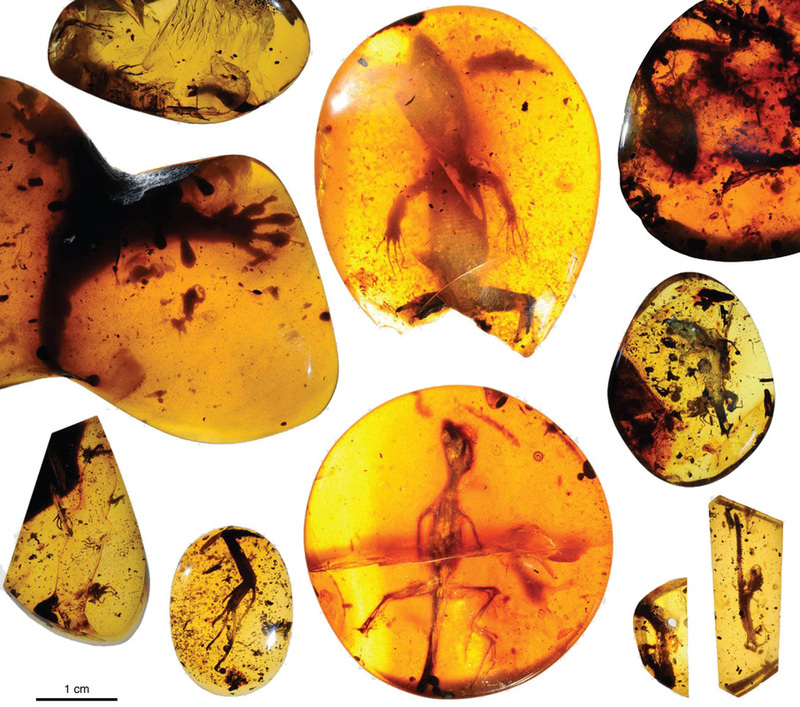 Over the past few years my co-authors and I have documented and described several lizards and frogs preserved Burmese amber from the Aptian-Cenomanian boundary (99 million years ago). CT-based analyses allowed us to extract skeletal and soft tissue details that were not visible using light microscopy. These observations helped us better place these the specimens in the tree of life. We were able to produce 3D printed, enlarged replicas of these CT scans, which will be placed on exhibit at several museums and provide important outreach tools for educators and scientists. Using contrasting agents like Lugol's iodine, we are able to visualize relatively low-density tissues like muscles, blood vessels and nerves in high resolution. This is incredibly useful, as it allows us to study anatomical features in ways that would be impossible with other methods. As the staining process is reversible, we can use this method to study the soft anatomy of specimens that would be too rare or important for traditional, destructive techniques. Natural history museums serve the scientific community as libraries of biodiversity information, containing hundreds of millions of biological and archaeological specimens. These collections are critical resources for a wide range of scientific disciplines. CT technology has the potential to massively increase the amount of data that can be extracted from any and all museum specimens, but can also greatly increase availability of the specimens themselves, through the creation and online curation of digital surrogates. By making research collections broadly and easily accessible we can maximize their applications for scientists, educators, and anyone else that is interested in learning more about the world around them. ﻿The Nanoscale research Facility at the University now houses a Vtome|x M CT scanner from GE. 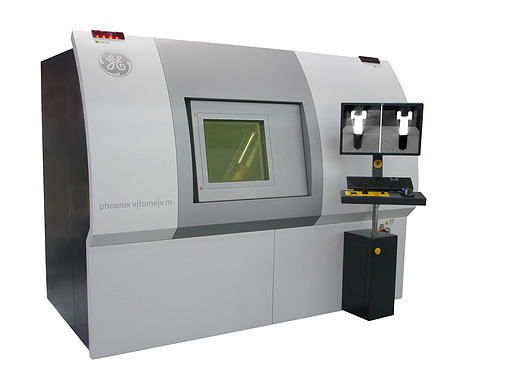 This versatile dual tube system is capable of scanning dense fossil material or scanning low-density specimens at sub-micron resolution. Post-processing of the CT data is performed using VGStudioMax, a powerful voxel-analysis software package from Volume Graphics.